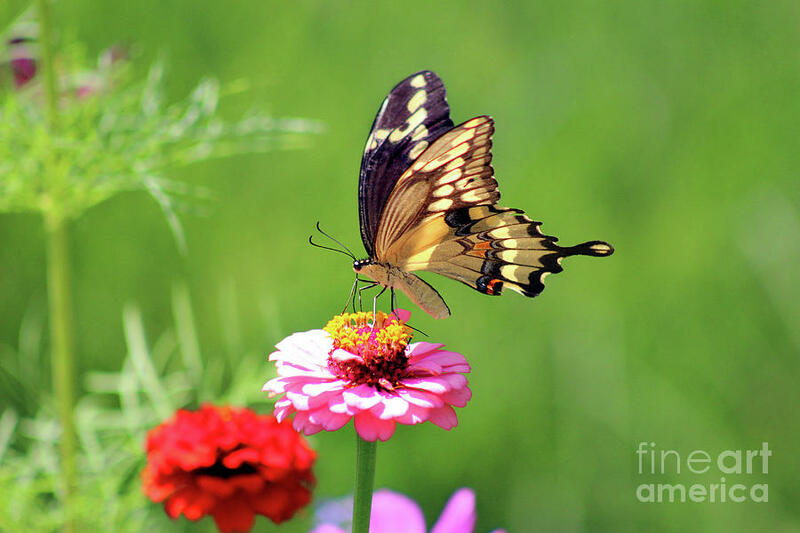 Giant Swallowtail Butterfly On Pink Zinnia is a photograph by Karen Adams which was uploaded on July 25th, 2016. 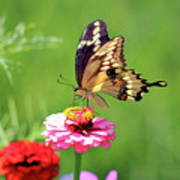 Butterflies love Zinnias, Verbena and Lantana. If you want to attract butterflies to your yard . . . it really isn't difficult. 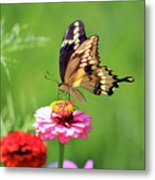 Find an area that you can clear and have at least decent soil . . . . then buy a bag of flower seeds that is designed to grow flowers that attract them (I have found some that even has fertilizers and mulch as part of the mix.). Put this mixture down and be sure to keep it watered! That is probably the most difficult thing to do . . . if you miss a day...the delicate seedlings can die . . . with a little effort you can have beautiful flowers that grow all summer and attract some beautiful butterflies . . . . and you are helping butterflies survive! A win-win! Thank you so much for looking at my images. I appreciate that very much. I am very concerned with our environment and have decided to donate any money I make from any sales of this image to the ENVIRONMENTAL DEFENSE FUND.....because the Earth needs a good lawyer! We all need to speak up and support efforts to protect our environment. We will not get a second chance! Thanks so much, Anita for the feature on the Groovy Butterflies group page!